To change text in core Joomla or in an extension (other than installing a new language) it is advised to perform a language override in Joomla. To do this you need to go into the admin backend then in the menu under "Extensions" click on "Language Manager"
Let us assume that you want to change the First name (in billing address fields) to My Name. 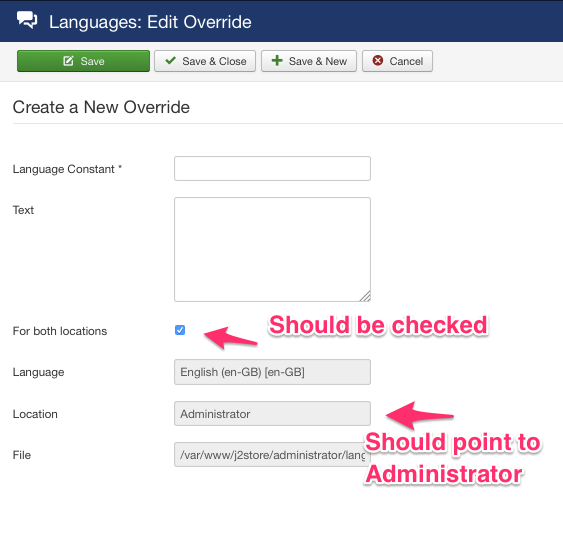 Step 1: Go to Joomla admin->Extensions Manager->Language Manager->Overrides. Step 3: You can either search or directly enter the constant (if you knew already) to create the override. Step 4: Now you have the constant. Enter the constant in the Language Constant box. Step 5: Enter your value (in our example My Name) in the Text box.